Where: Abbey Home Farm, nr Cirencester, Cotswolds. How much: £3 each for adults, £2 for kids. No other charges. Half term has been a serious wash out, I felt very sorry for anyone who had booked a week camping in the downpour. Cold and wet, not fun and what’s worse things start to get expensive, looking for indoor activities and eating out. However, as the end of the week approached I noticed some little sun icons appearing on the weather maps. It looked like there would be a break in the weather, sunny spells! I’ll take that! 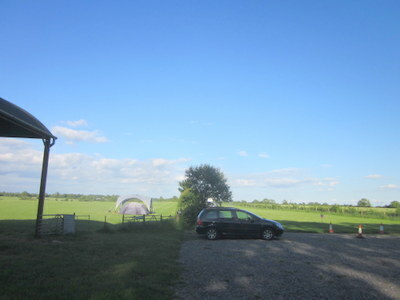 I had recently come across a campsite only about an hour from us that looked promising Abbey Home Farm, near Cirencester. So Saturday morning, clothes packed, food sorted off we went. As we approached the busy farm shop it was a little disquietening to find absolutely no reference to a campsite. However, secure in the knowledge that I had thoroughly read the website, I reasssured the doubtful husband and went into the shop, which turned out to be an absolute cornucopia of organic goods. A wide variety of stock, incuding fresh produce, bread, frozen foods, chocolates, cakes, jars of sauces, pickles, and lots more. Even a large section dedicated to textiles, clothes and jewellery, all ethically sourced. There is also a large and attractive cafe. If I lived in Cirencester, I’m sure this would be a regular haunt! 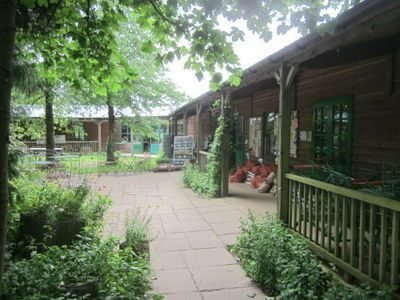 The very lovely ‘Organic Farm Shop’. The lady behind the counter, turned out to be the owner. She was very pleasant and informed me that there was only one other family currently on the site and the cost was £3 per adult, £2 for children and £5 for hire of the brazier. Absolute bargain!! We were given a code to get into the gate for the campsite, which was actually back down the lane and up the main road a little to another gate. The track leading to the campsite passes through a field of barley, with red poppies bursting out of it. Very pretty. 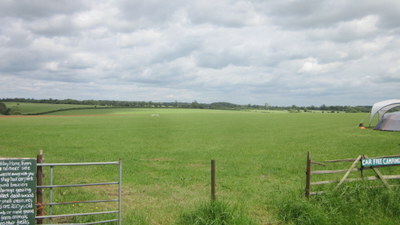 At the campsite itself there are two fields seperated by a mature hedge. 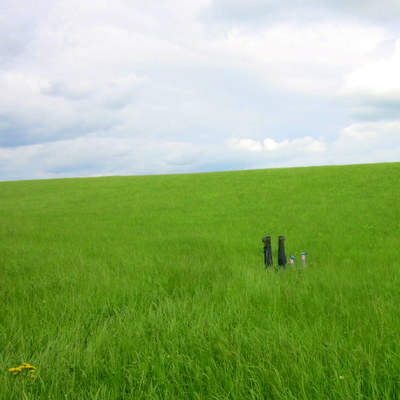 One side is for carless camping, no vehicles at all are permitted onto this field, wheel barrows are provided to carry your gear. The other side of the hedge is for campervans and those who want their cars with them. I was a little disappointed as the view from the carless field was much better than the campervan side, however, I couldn’t really complain as we had the whole field to ourselves! View from carless camping field. 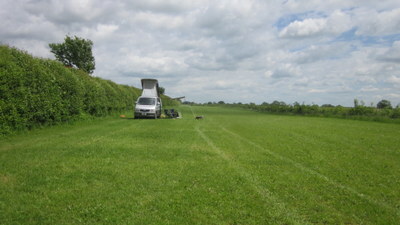 The very empty campervan field. In fact, the view from our field was over a flat field of barley with a few trees on the horizon. A good spot for big skies! We had been given a map of the whole farm. There is a lovely little woodland, some yurts in a seperate area, the farm shop, some free range pigs and a shortish walk around the fields. 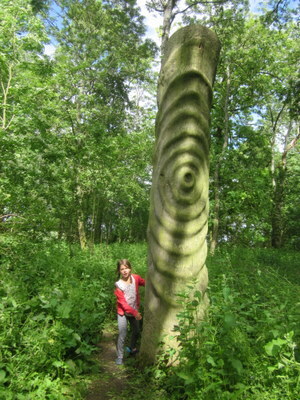 A beautifully carved totem pole marked the start of the walk and invited us to explore. The walk itself was mainly around some crop fields, pretty enough but no wow and the kids were, initially, a little underwhelmed. It brings you around in a very well signposted circuit back towards the farm shop where we stopped to get few extra supplies. They also sell wood and kindling, you can bring your own but no foraging in the woods! The final part of the the walk takes you back to the campsite through the woodland, undoubtedly the best part of the walk and unless you have a hankering for wide open skies I would recommend just exploring the woods. Dotted around you will find carved trees and sculptures, plus plenty of wild life, our fellow campers saw a deer up close standing in the middle of a path. 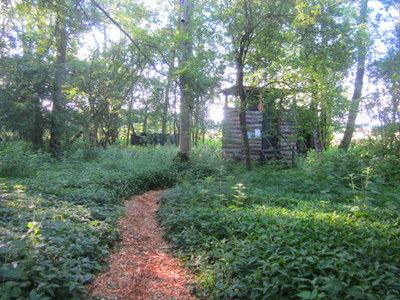 The woodland is also home to the ‘facilites’ . 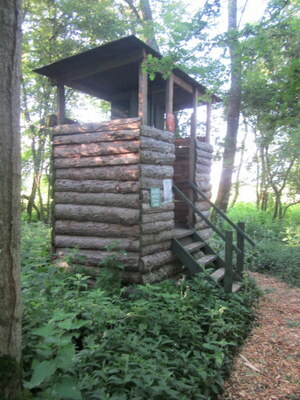 The facilites consist of two composting toilets each for men and for women, a hay bale pissoir for the men, a stand pipe tap with wooden platform for hand washing, and two bush showers. Now, I thought it was all rather charming, although you wouldn’t catch me trying to have a shower – you have to warm some water on your fire and bring it over and pump it with a foot pump to create the shower, umm, no I think a babywipe wash will do actually! My husband, who is far more practical about these things pointed out that it was all a bit musty and in the rain would be a little too open. The ladies! There are two toilets in there, and yes there are doors. View from inside ladies! Rather lovely I reckon. 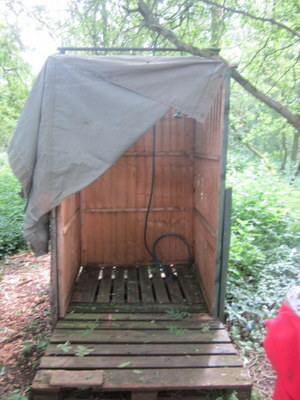 Bush shower – a step too far for me! As I always find with composting toilets there were no nasty smells and the kids where perfectly happy using them. Make sure you take some loo roll as there was none. If you are a bit choosy about your tolieting facilites this may not be your kind of place and to be honest for more than a couple of nights it would probably stretch my positivity a little. However, it really isn’t an unpleasant experience, so if you are a bit unsure just try it, it will be fine! As we were only staying one night we didn’t get to explore the area. However, I understand Cirencester is a very pleasant market town, historically an important Roman settlement; and nearby is the Cotswolds Water Park and Country Park, lots of fun for kids. One final thing that needs to be mentioned, unfortunately is a down side. The roads are not very close to the camping area, but somehow the geography of the place means that there is a fairly constant background hum of traffic. Easy to tune out but worth pointing out. I don’t think I have ever been to such an empty campsite, and I doubt it is ever crowded, however, the experience of the campsite with more people would undoubtedly be different. Hi Recipe Junkie, I must admit I used to be a little scared of ‘composting toilets’, of course they are fine, these are pobably the wildest I’ve been in. 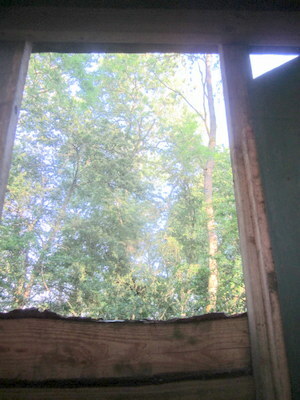 Completely open to the woodland through the ‘window;. Quite a nice experience I thought. Not sure about the showers though! Just had a look at the Sustainability Centre and got all excited, unitl I noticed the no vehicles rule. Darn. No campervan then. No fair! Looks lovely! I used to work here! About 10 years ago when the farm shop was tiny, I must go back and take the girls camping, the owners are lovely and extremely enthusiastic about green living. Thanks for this, excited at going back now! No way! What a coincidence! The farm shop was totally ace, I even bought some lovely jewellery there! Thanks for your really helpful review, Hazel. Love your site! Thanks Sophie! Thanks for dropping by.